The videos (below) are heart breaking. 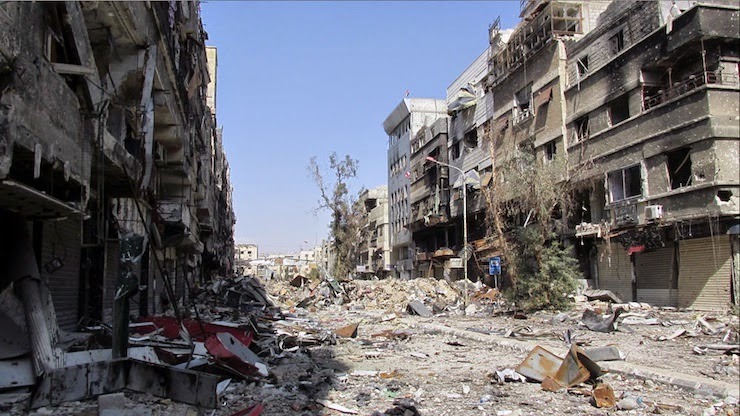 The Palestinians in Yarmouk are besieged on all sides - by the butchers of ISIS and Al Nusra, ably supported by Israel, and bombed from the air by Assad. As Palestinians are being murdered and starving to death in the refugee camp near Damascus, the Arab world is busy intervening in Yemen, the Palestinian Authority is silent, and Israeli television is talking about where to eat during the Passover holiday. Monday morning, on the morning show on Israel’s Channel 10, which was co-hosted by the station’s military correspondent because the regular hosts are on vacation, they were supposedly discussing recommendations for the Israeli holiday traveler. After describing Israelis on vacation as ugly and litterers and more, the hosts recommended places to see and good places to eat. The host, Or Heller, kept the jokes coming. “Yes, in the Yarmouk Camp … well ISIS are the only ones eating there.” Making fun at the expense my people in the camp that has been under siege for three years really got to me. I got up and went to the kitchen without changing the channel and listened to the rest of the program from afar. And then, another half-joke comes out of the television set, this time as part of their map of holiday traffic jams, about what icon Waze should have to indicate where ISIS is in the Yarmouk Refugee Camp. I couldn’t get over the anger and the pain, and wasn’t able to continue by daily routine. 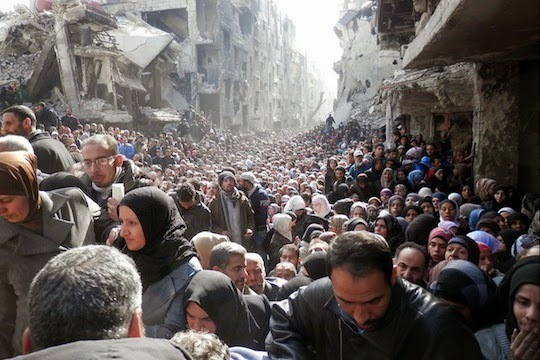 People don’t understand just how bad the situation is in the Palestinian refugee camp in Syria. Tens of thousands of Palestinians, famished and under attack, are sitting prey for a group of fighters/rebels/terrorists/Assad supporters. We, the Palestinians, and the entire world, don’t really know who’s against who or what they are guilty of. There have been more and more reports of bodies, horrifying murders and wounded in recent days. When the war in Syria began three years ago, we, the Palestinians here in Israel, were angry at them, with utmost self-righteousness, that they didn’t join the revolution against Assad. Later we understood their immense fear of getting mixed up in it. The reports we’ve gotten in the past three years about what the Assad government has done to Palestinian youngsters in the refugee camp are simply horrible. Later we got mad at al-Nusra Front, which entered the camp as an opposition force to the regime and were angry that the organization was terrifyingly executing people on the streets. Its fighters raped young women and committed other crimes against humanity that are documented and available for anyone to see on the Internet. And now, news that ISIS united with al-Nusra Front against the poor Palestinians in the Yarmouk Refugee Camp, for reasons that aren’t entirely clear — aside from al-Nusra’s fear that it was losing control of the camp, and joined ISIS to defeat a group of Palestinian youngsters who organized themselves in an attempt to defend the camp. They call themselves “Aknef Beit al-Maqdis” (The Environs of Jerusalem, in Arabic). 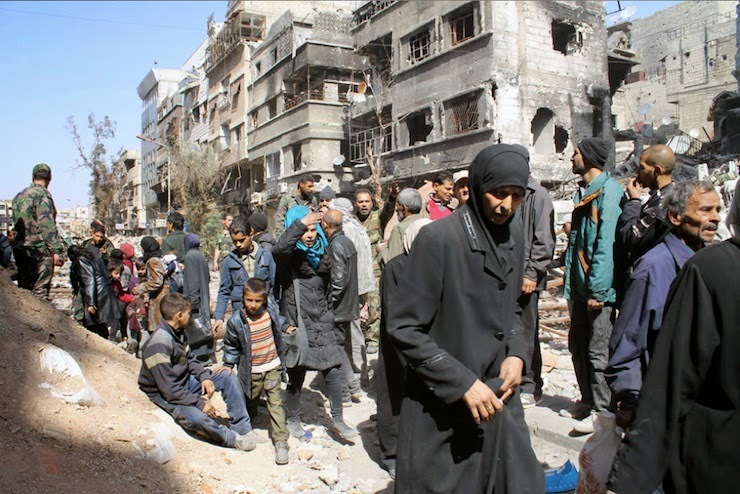 Refugees who fled for their lives to every corner of the world from Yarmouk have described the terror and the smell of death that permeates the camp. “People are eating each other out of starvation,” somebody wrote. There has been no running water since September, and the world is silent. Palestinians the world over search for snippets of information about their relatives in the camp and, over and over again, see photos of funerals, and that video, in which a boy who hasn’t seen a slice of bread for months tears your heart open with his tears. The descriptions and the photographs that make it out are reminiscent of the eternal photos of concentration camps, or of ethnically cleansed villages in Bosnia. For we Palestinians who are outside the walls of the Yarmouk refugee camp, our utter and complete helplessness is unbearable. Even organizing a small demonstration in Haifa over the weekend was emotionally trying for the activists, who came with overwhelming despondency, anger and sadness — about the entire world that is simply ignoring what’s happening, about the Arab world that managed to organize a special military force in Yemen overnight, about the silence of the Palestinian Authority, and about the impotence of the international community. I know that my anger toward the Israeli television presenter who tried to make jokes about my kin in Yarmouk is actually anger about the entire situation. It is anger at the irrationality of it all, the injustice, and the war that is crushing thousands of people — and that nobody cares. It’s a shame. It’s a shame that there isn’t any oil or natural gas under that refugee camp. If there were, I’m sure that an alliance of freedom-seeking nations would quickly come together — with the backing of the UN, of course — to save all those innocent people. Samah Salaime Egbariya is a social worker, a director of AWC (Arab Women in the Center) in Lod/Lyd and a graduate of the Mandel Leadership Institute in Jerusalem. She is a blogger for our Hebrew-language sister-site, Local Call, where this article was first published. Read it in Hebrew here.